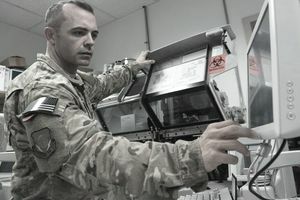 There are many Air Force Enlisted Jobs, one of which is a Biomedical Equipment specialists are tasked with helping to keep the Air Force's healthcare technology top-rate. Below is a detailed job description, duties, and responsibilities. If you like what you see, and aren't interested in having one of many Aircrew careers that exist, you'll want to take careful note of the qualifications. A Biomedical Equipment specialist installs, inspects, repairs, and modifies biomedical equipment and support systems. They then perform pre-purchase evaluations of medical devices. You may even be asked to advise on operational theory, underlying physiological principles, and safe clinical applications of biomedical equipment. You won't just work with other members of the military. People in this job implement organizational maintenance support for all medical devices used within the medical treatment facility (MTF), medical research laboratories, air transportable hospitals, clinics, and contingency hospitals. In this role, people look to you for guidance in high-pressure situations. They provide support to technical teams and intermediate maintenance teams to support them on the medical equipment systems they use when they are assigned to a regional Medical Equipment Repair Center (MERC). This type of position fosters people who are looking for a career in which they can grow. Eventually, you will direct an entire facility management program when assigned. A lot of what you'll be doing requires assembly and installation to inspect new biomedical equipment. That means you'll be assembling equipment and conducting pre-operational tests to verify everything is in compliance with medical and technical standards, specifications, contracts, and regulatory guidance. There are different duties are responsibilities for junior and senior-level specialists. If you haven't already gotten the gist, installation is a big part of this. You will need to install, or at least coordinate the installation of, medical equipment that requires interface with other devices or with the facility. Furthermore, if there are any maintenance support problems, you will need to resolve those. When you're not assembling, installing, or fixing equipment, you'll stay busy testing complex medical equipment and installations. For example, you might be testing diagnostic radiology systems and physiological monitoring systems. The testing process involves conducting pre-procurement surveys and providing technical advice on the purchase of new biomedical equipment systems to make sure they fit the required facility interface requirements. A large part of the job involves abiding by each manufacturers' technical literature, pertinent federal regulations, national standards, state and local laws, and Air Force guidance. Part of that means being proactive to make sure you know all of the electrical, electronic, optical, mechanical, pneumatic, hydraulic, and physiological principles of the equipment so that you can diagnose and locate system malfunctions before they become too large of an issue. This is no small undertaking. You will even be authorized to make modifications to biomedical equipment where you see fit, and that is a big responsibility. On the other hand, one of the more obvious job responsibilities is to identify deficient equipment. Once you do so, it is your responsibility to initiate corrective action and inform personnel of possible safety hazards. Part of that means having to complete quality control reports to ensure the accuracy of bench stock balance records and historical maintenance records (HMRs). Some tasks are kind of administrative. It will be your job to keep the medical equipment warranty and guarantee program up to date. You will also have to develop statements of work (SOWs) and manage the medical equipment contract maintenance program. When you advance to becoming a senior specialist, you may be assigned as a facility manager to manage resource protection, security, energy conservation, fire protection, communications, housekeeping, and facility maintenance programs, as well as maintaining liaison with base agencies such as civil engineering (CE), communications, and contracting to acquire services for operation and maintenance of the facility, the installed equipment, and utility systems. At this rate, you have probably learned most of the processes, so you will be part of projects to acquire new equipment from the beginning. This means you will coordinate project construction, maintenance, and alteration for the facilities you work with. Of course, you will also be managing staff. But it won't just be a staff of other specialists. You will be responsible for the maintenance of the hospital environment and of housekeeping. You won't only investigate the equipment. You will now also conduct periodic inspections of the MTF and evaluates issues relating to maintenance, safety, fire protection, and disaster planning to ensure compliance with National Fire Protection Association (NFPA) codes and Joint Commission on Accreditation of Healthcare Organizations (JCAHO) standards. Because you now manage a staff, you also have some important administrative duties like verifying reimbursements to CE and contractors and accumulate cost data to support facility budget requests. Knowledge of biomedical equipment systems is mandatory. Completion of high school or general educational development equivalency is desirable. A basic biomedical equipment maintenance course is mandatory. All of these are supervising functions such as installing, calibrating, repairing or modifying biomedical equipment systems. There are some physical and personal requirements.